“Shirley’s coaching came at a pivotal point in my career and I will always be grateful for the advice which has shaped my leadership style ever since”. We may not all want to be millionaires but most of us would like to be out of debt. So says Shirley McKinnon, Perth author of the fast-selling “Coach Yourself To Wealth”. Shirley, who hails from Leeming and runs her company, McKinnon Sales Centre Pty Ltd, in Osborne Park, has launched her new book, targeting people’s phobias about money. “The book is about people’s subconscious barriers about money and wealth which they don’t know they have,” Shirley said. “Our intentions and our goals are aimed at being financially wealthy. Because we aren’t, we think the reason must be external to us. That’s not so. The book comes from Shirley’s years of experience and research into the matter when dealing with sales teams and other business people. She said that even someone’s family birth order could affect the way they handled money. 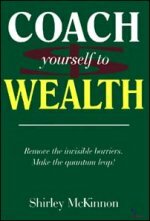 “Coach Yourself To Wealth” is Shirley’s second book after “Team Play, Strategies for Successful Business Management”. It is available in all good bookstores or purchase online.